Lately there's been a buzz about quartz becoming the leading choice of countertop material, surpassing granite and marble. According to the National Kitchen and Bath Association, the durability, new styles, and affordability of quartz are the key reasons so many homeowners are opting for this composite stone. While quartz is undeniably a respectable countertop choice, nothing makes a statement like the beauty, elegance and durability of natural stone--especially granite. And now that recycled granite is becoming a viable industry, granite that is mined can be used in its entirety, saving landfills from being choked with discarded stone scraps. Dr. Fred Hueston, Chief Technical Advisor for Stone and Tile PROS, says there are several other reasons to consider granite over quartz for your countertops. Granite is naturally varied in pattern. Granite slabs are like a Picasso; no two pieces are alike. Quartz, on the other hand, has a uniform appearance. Granite is resistant to heat, but quartz can be damaged by heat. 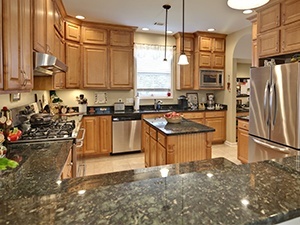 Granite is considered a luxury and will increase the value of a home, as opposed to quartz. Think about it. Would potential buyers rather have natural stone or plastic countertops? Quartz is sensitive to UV light and will discolor if used outdoors. Natural, non-resined granite will not. As a natural material, granite is a greener product than quartz. As it is quarried, it produces fewer carbon emissions compared to the manufacturing process involved in factory quartz production. In many markets, quartz surfaces are more expensive than natural granite. That’s like buying a car kit that looks like a Porsche and paying more for the replica than a real Porsche. Hueston also adds that it's in the best interest of the manufacturers of alternative countertop materials to advance misinformation about granite. You can always count on Stone and Tile PROS for helpful, accurate information about natural stone and tile and how it can be incorporated into your residential or commercial property.